Alex spent his formative years growing up on a cattle farm in the Western Cape, South Africa. After completing studies in Marketing and Business Management, he joined the world renowned Londolozi game reserve in 1995, as a game ranger. Alex worked as the environmental manager, presented for the marketing team and conducted specialised safaris. Alex’s greatest fascination is traditional skills of wildlife tracking. He has dedicated much of his life to learning the ancient skill, eventually qualifying as one of a handful of tracker assessors in 2004 – the youngest ever to achieve this feat. Over the last two decades Alex has tracked jaguars in the Amazon jungle, bears in California, grizzlies and wolves in Montana and the famous black-mane lions of the Kalahari. Alex is the general manager of the Tracker Academy, a NGO which trains unemployed people in traditional skills of tracking. In addition to his conservation work, Alex has worked as a facilitator for Vulindlela Transformational Services conducting diversity training. Here he led courses aimed at facilitating a better understanding between black and white people working in corporate South Africa. Alex is the founder of Power Supply, a company which produces fortified foods for rural markets and bulk feeding. The company distributes over a million meals per year of its vitamin enriched products. Alex and Renias continue to work together in the bushveld, as well as to conduct motivational presentations in South Africa and abroad. Their inspirational presentation, The Power of Relationships, has relevance for both local South African as well as international audiences. Alex is the co-author of bestselling animal tracking book called the Tracker Manual. Renias Mhlongo was born in a mud hut in what is today the greater Kruger National Park. The Mhlongo family sustained themselves on the land by growing vegetables, tending cattle and hunting small game. Renias, almost as soon as he could walk, was sent out to tend the family’s cattle herd. He is one of the last people to be raised in the original traditions of a Shangaan hunter-gatherer. During forced removals of Apartheid regime, Renias and his family were sent to a settlement called Dixie. Without any formal education, he was forced to seek work at a game reserve as a labourer. In 1984 he became a tracker at Londolozi – thereby putting to use his exceptional skills as a naturalist. Over the last 34 years Renias played a pivotal role in habituating the world-famous leopards of Londolozi. Renias has conducted tracker training workshops in South Africa, Brazil, Kenya and North America – teaching people the traditional skills of trailing animals. In addition to his extensive experience with African animals he, with Alex, has tracked animals all over the world. Using his tracking skills Renias has also conducted small mammal surveys for game reserve owners in South Africa. In 2010, Renias became a principle trainer of the Tracker Academy. Renias is also a co-author of the Tracker Manual published by Struik Nature. Renias has travelled internationally, and in so doing has touched many by the gracious manner with which he teaches people about African wildlife, culture and philosophy. He is a natural storyteller. He taught Alex the art of humorous storytelling, which comes out strongly in their motivational presentation, “The Power of Relationships”. During their inspirational presentation, Renias provides personal insights to relationship building and the power of diversity. The two speakers from very different backgrounds share their motivational talk, The Power of Relationships. 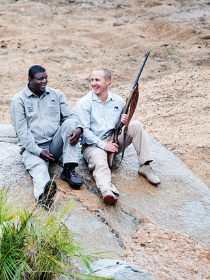 Alex van den Heever and Renias Mhlongo have worked together for 23 years, conducting safaris and training wildlife trackers around the world. Their work has taken them all over Africa, including Australia, England, South America and North America, and they have been featured in several TV news documentaries, most notably CNN International. Their long friendship and working relationship represents an inspirational model for a multicultural South Africa. The presentation is ideal for businesses struggling with issues of diversity and transformation in South Africa, particularly considering its unique cultural landscape. Though the system of Apartheid ended in the early 1990s, its impact can still be felt in modern South Africa, where racial, cultural and class differences are still often perceived as barriers between people. Two friends and colleagues who have utterly broken down those barriers, Alex van den Heever and Renias Mhlongo are now sharing their story, “The Power of Relationships,” with the goal of helping others overcome obstacles to communication and forge the power of diversity. The presentation tells the true story of Alex, a white game ranger, and Renias, a black tracker and inheritor of the Shangaan pastoralist tradition. In working side by side and sharing a love of wildlife and animal tracking for the last 23 years, a relationship developed between them despite their racial and cultural differences. In order to get to know each other well, they taught each other their own languages. “Learning Shangaan has made significant a difference in my ability to understand Renias and his approach to life,” Alex commented. The presentation also details the two men’s encounters with each other’s cultures. First, Alex visited Renias’s village, Dixie, where he was treated as a VIP guest. “In the 1990’s I thought that the villages were no place for a white person,” Alex commented, “but I experienced a level of generosity I had never experienced anywhere else before.” Renias then joined Alex for a trip to London, his first trip out of Kruger Park and his first encounter with a large European city. The two share a thrilling story about how Renias saved Alex from a leopard attack – a momentous occasion which caused trust to develop between the two men. “Our goal in sharing our story,” says Alex, “is to inspire others to open their minds and to learn how to actively participate in diverse teams. We want to show that it’s possible to build deep trust and a productive relationship with someone from a different culture. We show that diversity can be a source of strength.” The speakers emphasize that their story is not meant only for South Africans, but for international audiences. In addition, they offer simple steps to get rid of prejudice behaviour and meet others on an equal footing. According to Alex, simply being willing to listen to and try to understand another person’s experiences is the first step in creating productive intercultural relationships. This inspiring talk was authentic, a real-life example and proof that many great things are possible and you can create a distinct advantage and make an impact that matters when you dig a little deeper and discover the enormous power of connecting!